The situation of prisoners at Terezín was complicated at the end of the War by the evacuation transports which arrived here between April 20th and May 6th, 1945. The thousands of pitiful and seriously ill prisoners who arrived at this time brought with them typhus, which quickly spread to the original Jewish occupants of the ghetto. Meanwhile, typhus was also identified in the Small Fortress prison. Doctors in Prague learned of this, and organised the Czech Aid Project to help prisoners at Terezín, which was led by the epidemiologist MUDr. Karel Raška. Members of the Czech Aid Project began work at the Small Fortress as early as May 4th, 1945, and at the same time made contact with members of the International Red Cross, which on May 2nd had taken over prevention at both the police prison and the ghetto. In the evening hours of May 8th the first units of the Red Army passed through Terezín towards Prague. 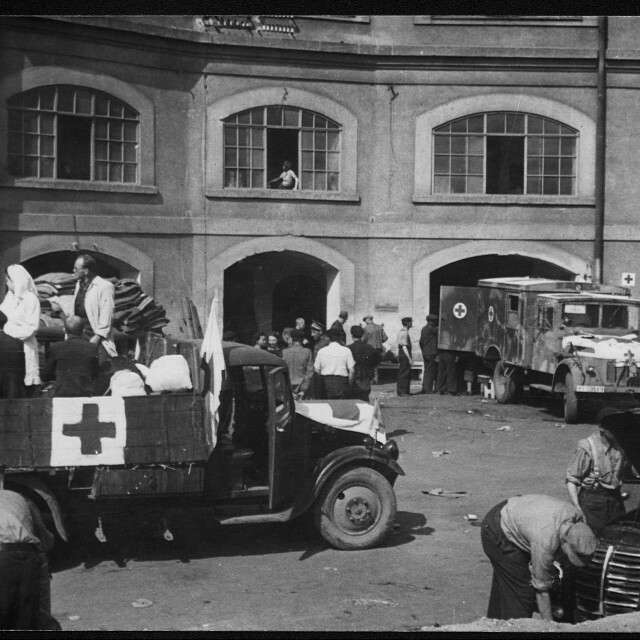 In the following days, at the request of the Czech doctors, the Soviet military took over preventative measures in all of Terezín, and also supplied much needed medical assistance. Together with Czech doctors and healthcare personnel, as well as the health service organised by former prisoners and dozens of volunteers from the surrounding area, they made a major contribution to stamping out the epidemic, which had already claimed hundreds of victims. Special mention must be made here of the self-sacrifice of all those who participated in this dangerous undertaking, without regard to time, rest of the danger of infection. By the end of May the worst of the epidemic had passed; some 30 000 lives had been saved. The repatriation of liberated prisoners, who came from a total of 30 countries, lasted until August 21st 1945.